Size of Male: 50-60 lbs., 22-24 in. Size of Female: 50-60 lbs., 20-22 in. The Wirehaired Pointing Griffon is a friendly, affectionate dog and makes an excellent family companion. They were intentionally bred in the late 19th century to be gundogs for hunters hunting on foot. They are lively, active dogs who are very willing to please and easy to train. “Griffs” love children and they are devoted to their family. Dogs of the Griffon type have long existed but their exact origins are unknown. The Wirehaired Pointing Griffon, on the other hand, is the result of Dutchman Eduard Korthals’s desire to have a gundog who could hunt over different kinds of terrain. He created a breeding program in the 1870s that lasted for about 20 years and produced this new dog breed. The new breed was a versatile sporting dog able to go into briars and underbrush, point birds and retrieve waterfowl. He used griffon dogs, German and French, Barbets, Spaniels and a Setter in his breeding program. The Wirehaired Pointing Griffon has a very loving and devoted temperament. They love to be around people and they are devoted to their families. They are especially good with children. Griffs are also lively and active dogs and they do need plenty of exercise in order to stay mentally and physically fit. They can become nervous and high strung if they don’t get enough exercise. Griffs are very intelligent and dog training is very easy. They are very eager to please. Griffs are also usually very good with other pets. Living Environment – This gun dog definitely prefers to be an indoor dog and wants to be close to people. They do not do well as kennel dogs. However, they need plenty of exercise so they are usually not recommended as apartment dogs. Grooming – Contrary to some sources, Griffs do shed. However, they shed less than some other breeds. They have a harsh, wiry coat that needs to be brushed and combed a couple of times per week. Hair in the ear canal must be plucked out to prevent ear infections. The dogs need to be plucked and trimmed a couple of times per year to keep them looking nice. You can talk to a dog groomer about how to do this maintenance on your dog or have them do it. Diet & Exercise – Wirehaired Griffs have normal dietary requirements. However, they are an active sporting dog and they do require frequent vigorous exercise. They are high energy dogs. If they don’t get enough exercise they can become high strung and nervous. They can become destructive in the home and unhappy without enough exercise. Health – Griffs are a relatively healthy breed but they are susceptible to a few dog health problems such as canine hip dysplasia, elbow dysplasia, entropion, ectropion, progressive retinal atrophy, cherry eye, umbilical hernia, misaligned teeth, and missing pigment. All of these problems are fairly rare in Griffs but they can occur. You should always talk to a breeder about possible health problems before getting a puppy. 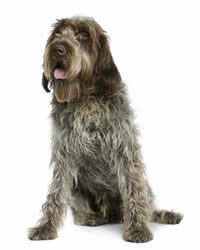 The Wirehaired Pointing Griffon is a very intelligent dog with a strong desire to please. Dog training is usually very easy. They can be somewhat sensitive dogs since they are so attached to their owners so it’s best to use positive dog training methods (praise, rewards).